I am going to be straight. I love my job. And I would much rather work than play right now. Spending time creating and growing my business is even more attractive than hanging out with my kids. And my boys are pretty awesome little dudes. This is a first for me. And it pains me. The other day Cole, my 7 year old, used one of my own coaching tools to reprimand me. I guess I had spent too much time in front of the computer that day and he had had enough. 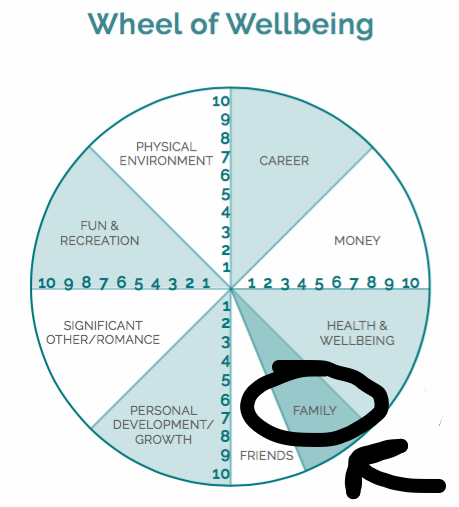 I use a wellness wheel that highlights 9 dimensions of health. I ask my clients to rate their level of satisfaction in those 9 key areas. Just for kicks, pretend you are my client and let's do it together now.